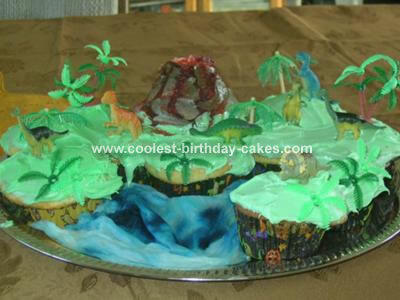 I used regular cupcakes to make this dinosaur island cake with one large cupcake made in a ramikan dish for the volcano. I arranged the cupcakes into an island shape with the tallest ramikan cupcake for the volcano. I separated store bought white frosting and added green food coloring for the grassy areas and made brown frosting for the volcano. The volcano also has red food coloring and red sprinkles for the lava. I decorated the cake with store bought dinosaurs and the plants that came with the dinosaurs. I used a damp paper towel with blue food coloring for the water. My three year old paleontologist “wanna be” was thrilled. Birthday cake idea posted by Athena L.